JASPER AT IT'S FINEST for collectors looking for the best scenic jasper to add to their collections. Absolutely breath-taking in its color variations, patterns, scenes and ability to take the highest polish possible makes RSJ the #1 specimen to place on your display shelf. One of the major pluses of Royal Sahara Jasper® over other scenic Jaspers derived from seams is that entire scenes are captured within the specimen due to its nodular formation. Virtually crack-free with no soft spots, this material has been hailed by lapidaries as one of the jaspers most desirable to work and the most fascinating of all scenic Jaspers. The potential variety of light to dark pinks, gold, caramel, cream, light to dark grey-blues, yellows, reds, and all shades of brown colors adds to the appeal. These are the attributes that make this fantastic material from the Sahara Desert so unique and highly sought after by collectors all over the world. The formation of Royal Sahara Jasper® is believed to have formed from hot mud flows 35 to 45 million years ago when the North African Sahara Desert was a combination of volcanic regions, tropical forests and saltwater seas. 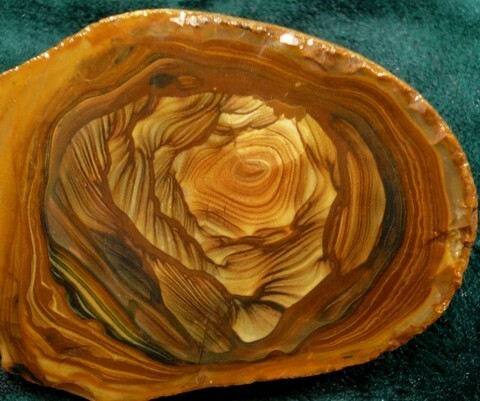 Fossils found with some Royal Sahara Jasper® and associated with the country rock supports this theory. Fancy jasper is a stone of gentleness and relaxation. It is professed to enhance one's ability to relax and bring tranquility, comforting, wholeness, healing, and gentle endings. As with all jaspers, it is also a good protection stone. Fancy jasper is reputed to be particularly good at bringing energies of wholeness and healing to an environment or situation. Picture jasper helps create harmony, proportion, creative visualization, positive things in business pursuits. It brings and shows hidden messages from the past as well as hidden thoughts, fears, and hopes. These qualities make it useful as an emotional/ psychological healing stone. Jasper in general is a stone of gentleness and relaxation. It enhances one's ability to relax and brings tranquility, comforting, wholeness, healing, and gentle endings. It is sometimes called the nurturing stone for its nurturing and protective energies. Psychically, jasper is used to assist with astral travel. In the physical realm, jasper is used for balancing yin/yang energies. Jasper is a variety of quartz, so it also has the metaphysical and healing lore energies of quartz. Royal Sahara Jasper® is a newly discovered gemstone found in the Sahara desert of North Africa. 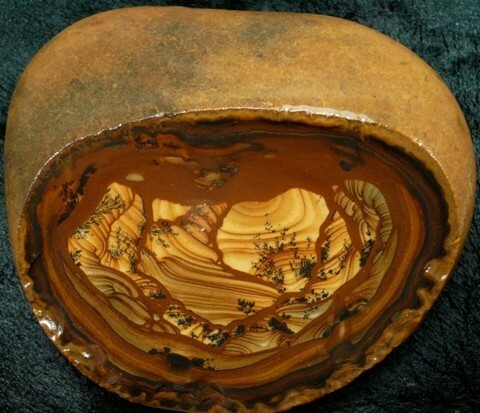 It occurs in rounded nodules which are brown on the outer surfaces, and contain vivid interior patterns of tan, black and brown. The energies of Royal Sahara Jasper® are stabilizing to the chakras, tending to bring the whole system into balance. Like other Jaspers, they strengthen the lower three chakras, enhancing ones vitality, creative fertility and will. They also resonate in a lovely way with the heart, engendering a feeling of gentle, loving energy there. The hearts resonance with Royal Sahara Jasper® feels like a gentle caress. At the throat, Royal Sahara Jasper activates ones capacity to courageously speak (or write) the truth of ones heart. These stones also (and rather surprisingly for a Jasper) vibrate strongly at the third eye. When worked with in meditation, Royal Sahara Jasper® can engender perceptions of spiritual shifts and changes coming in the future. This is one of the stones of the New Jerusalem, an esoteric term for the Earth in its soon-to-be transformed state, in which the spiritual and material worlds are in full conjunction. Meditation with Royal Sahara Jasper® can facilitate visions in which one can glimpse the potentials of what is to come as we approach that great conjunction. At the crown chakra, Royal Sahara Jasper® can help to awaken ones inner link to the Divine, opening one to receive the awareness of I Am That I Am. This signifies the selfs attunement to ones spiritual origins. If one places one piece of Royal Sahara Jasper® below the base chakra and another at the crown, the two stones can draw the energies of the entire chakra column into full connection. This is a very valuable attribute, and one can benefit greatly from daily use of the stones at the beginning of a meditation session. In self-development, it encourages persistence and discipline.